What type of room can be eaten? I hope that one made you giggle! We’re celebrating National Mushroom Day the best way we know how, a stuffed mushroom recipe. I love making stuffed mushrooms for Thanksgiving but they’re honestly great as a side dish for any main entrée. Now, let’s get to cooking! Begin by preheating your oven to 350 degrees. Take all the mushrooms and cut off the stems of each one. Separate them as you will be using the stems to cook later. Then on a skillet drop in the Kelapo Ghee and turn the heat on high until it’s completely melted. In the meantime, chop the mushroom stems into very thin pieces and add it into the skillet. Once they’re in the pan toss in the salt, pepper and chopped garlic. You’ll want to stir and cook for about 6 to 8 minutes. Make sure you do not burn the garlic or it loses all the flavor. After, it’s done cooking remove from the heat and let it cool down a bit. Then in a medium-sized bowl toss the cooked stems, cream cheese, breadcrumbs, parmesan (only half), chopped parsley, salt and pepper, and with a non-stick spatula mix until everything is evenly combined. 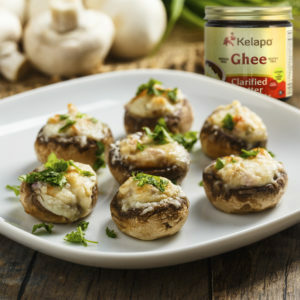 Then take a baking sheet and spray a bit of Kelapo Ghee Non-stick Cooking spray and evenly spread out the mushroom caps upside down. Using a spoon, take some of the garlic-mushroom mixture and place it on top of each mushroom. Sprinkle parmesan over each mushroom but make sure it stays on the top. Place in the oven and bake for 20 minutes. You can add some extra parsley for garnish if you like but I usually serve them just like that. Now, this recipe is one a friend recommended and I think it’s great, especially if you’re a mushroom lover! Begin by preheating your griddle to high. In a medium-sized bowl, add the Kelapo Coconut Oil, minced garlic, oregano, salt, and pepper, and stir everything together. Grab your portobello mushrooms and clean them by scraping out the gills. Then take a brush and brush the mixture on the portobello mushroom caps. Let them marinate until you’re ready to place the burgers on the grill. Next, in a separate bowl add the ground beef, Dijon mustard, salt, pepper, and shredded cheese, and mix everything together. Then, form the meat into rounded patties. Now place both your burger and “buns” on the grill. Let the “buns” cook for about 8 to 10 minutes and the burgers for about 10 to 12 minutes depending on the if you like medium rare or medium well. Grab two “buns” place your burger in between like a normal burger. Add any extra toppings you’d prefer like tomatoes, lettuce, pickles, and ketchup. Plate and enjoy! Have any more mushroom recipes? Share in the comments below!